in So. Cal history. On the way to leading Harvard-Westlake to a 27-2 season in 2011 to capture their first-ever CIF Souther Section Championship, Grossman was named the All-CIF Girls Water Polo Division IV Player of the Year. Bound for Stanford, Grossman leaves an impressive high school legacy that includes being a four-time All-CIF first team honoree and three-time Mission League MVP, and recipient of numerous tournament, team and academic awards. 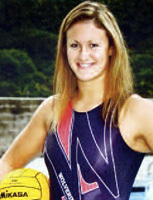 Outside of school, Grossman has been successful in Junior Olympics and Club competition. She was the leading scorer on a USA team that won the silver medal at the 2010 FINA World Prelims in Puerto Rico, and one of the offensive leaders on the bronze medal-winning USA squad at the 2009 Junior World Championships in Russia. She was named MVP of the 2010 Junior Olympics 18U Platinum competition, leading her team to a gold medal. Grossman is also competitive in the classroom, earning Honor Roll status for six consecutive years and being named to the USA Water Polo Academic All-American Team for the past three years. She also volunteers with the Make A Wish Foundation, Special Olympics and the Turning Point Homeless Shelter.